Hello Nosh Show Listeners! How are you doing? The bad news is that we still miss Eric, but the good news is that it wasn't just the three of us this week. That's right, we are four once more. Will hilarity ensue? What will we chew? Do I live in a shoe?? Will I stop rhyming before I turn blue? So my Episode 103 Nosh or Not of the week gets a follow up live on the show, but let's start from the beginning. 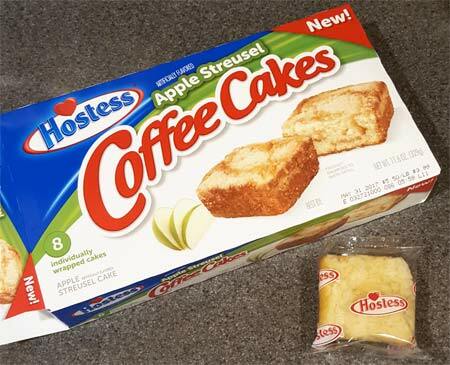 I had tried the new Hostess Apple Streusel Coffee Cakes the morning of the recording the show and I did not like them. I could not get the thought out of caramel out of my head. I was pretty annoyed and figured it would make for a good not of the week. I bring this up at the end of the show and Chris and I decide to both try them again during the show. There is going to be some back and forth but keep in mind that when I opened the package, I was at my desk, so I carefully unwrapped the cake which meant it was upside (listen to the show, this comment will make sense then). Now, if you take a big sniff of the top of the coffee cake, all you will smell is (artificial) apple. Once you get that apple thought in your mind, it's easier to tell that these cakes are supposed to taste like apple. I still contend it's a caramel apple flavor at best (and artificial food science at worse). They aren't tragically bad, but I much prefer their classic cinnamon coffee cake version to this new version. To put it another way, my family left them for me to eat whereas the regular version usually disappears in no time. 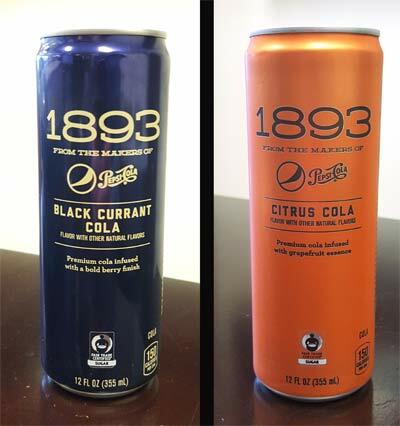 We also talked about the two new Pepsi 1893 flavors during the show. I enjoyed the black currant cola, but I couldn't really taste the berry flavoring and somehow this turned in to Marvo convincing me to try the 1893 Citrus Cola version. This turned in to a $1.25 mistake. It wasn't horrible horrible, but you can smell grapefruit the second you pop open the can. I guess if you like grapefruit (or even mango in this case), you might dig this, but it was hard to get passed that smell on every sip. Keep in mind that I didn't really like the taste, so I'm taking smaller sips, so I'm having to smell it that much more. In other words, skip this unless you like grapefruit. Alright, have a good week everyone!